Hi there! 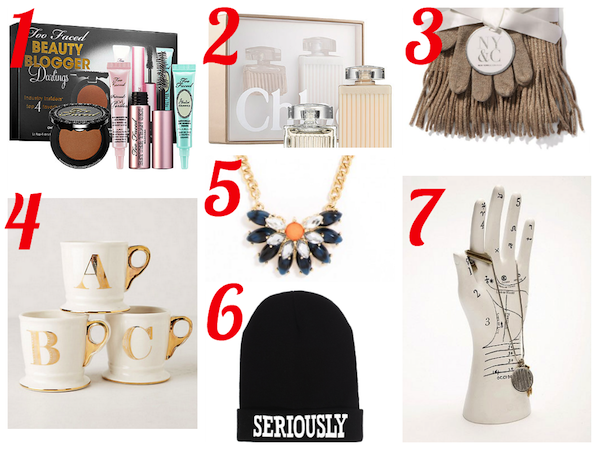 In the spirit of the holidays, I decided to create holiday gift guides for those who need some inspiration. Today's is geared towards females (girlfriends, bffs, moms, sisters, etc. ), and as a bonus -- they're all $20 or less! I hope this guide cures any gift-hunting woes that you may have. Check out details and links for each product below! Thanks for stopping by! Even if you aren't interested in this specific product, I highly recommend checking out Sephora's gift section online. They offer a wide variety of gift sets at different price points, and many popular items go on sale for a temporary period of time. I originally intended to include the Stila "In the Garden" palette priced at $19, but it went back to regular price by the time I made the collage. That being said, grab your items when you can! I think this Too Faced set is perfect for a makeup lover because it comes from a quality brand and offers a nice variety of samples. For $20, it is definitely worth the checkout! What fragrance-loving girl wouldn't want an affordable set by a luxury company? I am honestly thinking about buying one for myself. The price is spot-on for a small gift with great value. Not only is this a great perfume for a night out, but it can also serve as a beautiful decoration in your bedroom! I have purchased these sets as gifts for about three years in a row. When it gets closer to Christmas, I've even seen them go for $5!! I think this is the perfect gift for those who aren't as close to you, but still close enough to deserve a little treat. It is packaged so nicely and offers fashion with practicality. Especially if you live here in the northeast, you can never have too many scarves! I think these mugs are absolutely adorable. For $20, you can gift someone a personalized set with their initials. I would also suggest buying some marshmallows, graham crackers, and chocolate to wrap inside the mug to create a smore's kit (or anything else delicious). I think it would be a creative way to show that you took the time to customize your recipient's gift! I've never actually shopped at Bauble Bar (I personally go for the $6 jewelry at Forever 21), but their 12 Buried Baubles online event caught my interest! Every day for 12 days, Bauble Bar unveils a new piece of jewelry that is priced at $10 or $20. The necklace I have pictured above was from the first day -- only $10! Again, you get great value at an even better price. This is for the girl who likes to embrace her inner Cara Delevingne. Asos has some of the cutest graphic beanies, and it's easy to find one under $20! My favorites are the "Seriously" one depicted above, the owl, and the "Bad Hair Day". Granted, these may be very light packages as gifts, but they're perfect for stocking stuffers! This gift is a unique piece unlike any other mentioned above. It's functional, but also has an interesting surface design. I'm sure any girl interested in fashion has a countless amount of jewelry, so why not help her organize in an awesome way? I also recommend checking out Urban Outfitters' website for more quirky gift ideas! Let me know in the comments below which gift idea is your favorite, and what you plan on buying for your loved ones! Thanks for stopping by, and I wish everyone a stress-free holiday shopping process! *Please note that I was not at all sponsored or contacted by any of the companies mentioned above. These are all strictly my ideas -- thank you!